Dinosaurs weren't using TeamSpeak and wiped about 66 million years ago. Coincidence? I think not. YaTQA is a tool for managing TeamSpeak 3 servers and instances using the query interface. If you don’t want to spend ages learning the query commands and understanding the output, YaTQA is what you need. It comes with support for any feature of the query interface. 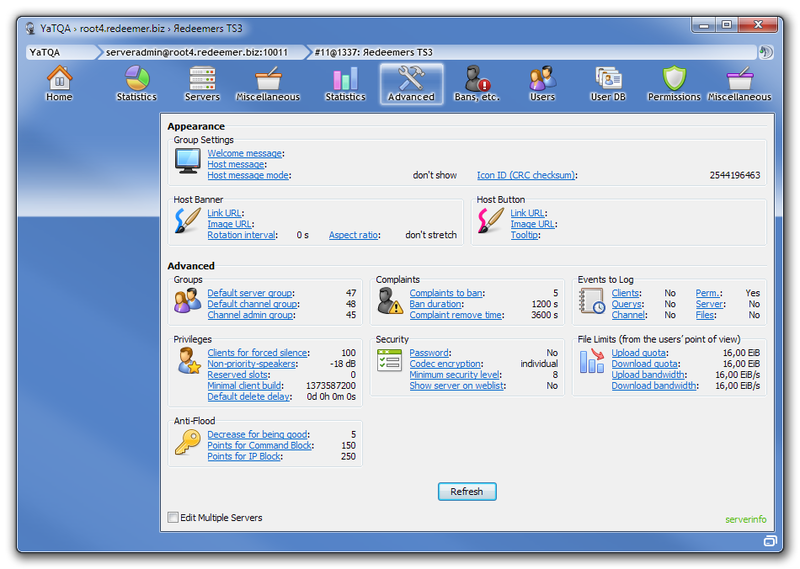 Free and fully functional for personal use, emailware (free) or donationware for ATHPs. Windows XP and up (or Linux via Wine), see system requirements. Despite the small size, this is the full installer. 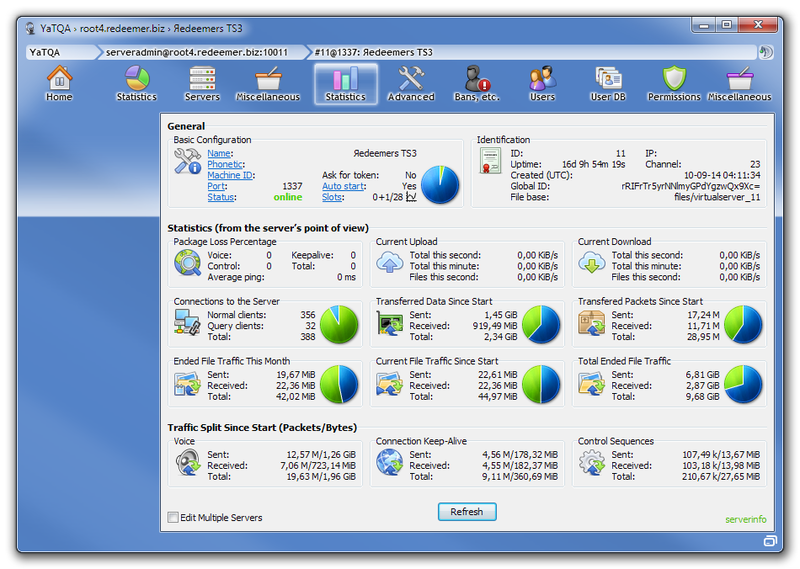 It includes the tool in English and German (selectable during installation). The installer does not modify your system, it just extracts the chosen language version and creates shortcuts if you want. If you don’t enable the Portable Mode in the installer, YaTQA stores some files in %APPDATA%\YaTQA. There is no adware/spyware whatsoever. Note: The English and the German blog both have a few posts that are not available in both languages. YaTQA 3.9.5.1-rc1 brings you support for TeaSpeak 1.2.30-beta1 (28 Nov 2018). Be sure not to run 1.2.30-beta0 (26 Nov 2018)! Also note that TeaSpeak is a very unstable piece of software and that YaTQA will likely crash it. This new version supports TeaSpeak’s log interface as well as the music bot feature. You can control the bot in many ways. You can drag and drop music from one bot to another (hold Ctrl to copy). Also, you can drag channel files and drop them on a bot. Start, pause, stop, skip or delete songs, adjust the volume or give your bot a cool name. Make sure your query group has instanceinfo permissions to make some features appear or work correctly. /Edit (30 Nov 2018): Made this an official release because the last official release had a lot of heuristic finds. There were some issues with the English version of YaTQA released earlier today. They were caused by the translation software not noticing recent changes in YaTQA’s UI. Those changes included the removal of features that are no longer needed due to server changes, such as resolving usernames or the ghost mode. For an unknown reason, references to these features were not removed from the English version (YaTQA’s original language is German). Because some of them existed in the 22 Oct 2018 beta release, I now know that not many people use the beta releases. Sorry for the inconvenience. Should you still notice any issues with missing properties, please let me know. Some people asked me about TeaSpeak. Since November, I am involved in the development in some kind and met Markus on Holy Saturday. I did not run a TeaSpeak server for over half a year now and have never used it for longer than a few hours or in a production environment. ts.teaspeak.de is no longer blacklisted. If you read the announcement carefully, it doesn’t announce a product named TeamSpeak 5 but a TeamSpeak 5 Client. It does not announce a server software, therefore the TeamSpeak 5 server will still be called TeamSpeak 3 Server. So although I am not in any closed alpha/beta, you can expect the server updates to continue to be small enough that a YaTQA update will be released within a day or two after a server brings new features. There are only a very few features in YaTQA that require compatiblity with the client, e.g. BBcode or DNS. ...mostly preparing YaTQA’s badges for tomorrows relaunch of TeamSpeak. ...bringing some fixes (e.g. maximizing still being unavailable in the freeware version) and small improvements (e.g. execution times in console, auto scrolling during drag and drop). YaTQA 3.9.2 has been released. It is now fully functional freeware for personal use and emailware/donationware for ATHPs so they must send me their ATHP link or donate. I just don’t want script kiddies to start an illegal hosting business. The new version improved blacklist2 (it will tell you if TeamSpeak doesn’t like your IP, domain or your server UID), adds support for all new 3.2.0 features and moves SSH to the freeware version. This is the first step of a transition announced last October because I got a decent job offer now and will be able to pay YaTQA’s expenses from my own money soon. I’m sorry for being late, I normally add new versions the day they get released. However, when I updated Firefox, my update checker configuration was lost. The preview release downloads are now served via HTTPS as well. This fixes an error with badges not displaying (resource 70xx not found) and with incorrect calculation of text length when replacing selected text. I’m sorry for the big number of updates right now. They are due to the transition to SVG and that TeamSpeak now supports Unicode in a few places. This fixes a typecast error when copying groups. No change at all to YaTQA. Both binaries are 100% identical, so there’s no need to update if you already have YaTQA 3.9c. I just updated NSIS. Just a fix for a bug that got into yesterday’s version (resource 3019 not found). PS: Download is now served via HTTPS. YaTQA 3.9 was released. It is the stable autumn/winter release for 2017/18 and is compatible with the final 3.1.0 server release released yesterday. See the 3.9-rc1 announcement below and the changelog for details. And here’s a pre-announcement: As announced in the changelog in October, the summer will bring you YaTQA 4.0 (a news on the UI rework will be released in the coming days) which will likely drop the requirement for the key to use some features. YaTQA 3.9-rc1 was released. This comes after a lot of beta versions (not announced in these news) which gradually improved the SVG support introduced in the first beta and added some new features, most notably the pseudo snapshot feature which helps you move from almost any host to an own instance, requiring only basic Server Admin permissions on the source server – at the cost of losing your server keypair (clients will receive a warning if they had the server bookmarked). Well, it could be worse. Oh, and support for server version 3.1.0 was added. That version is so ridiculous, I almost forgot to mention this change. YaTQA 3.8 was released. It is the stable summer release for 2017. It includes the changes from 3.7.3-beta on (see below). It also includes the new SSH tunnel with less requirements and better performance (that’s in beta right now, please report issues). 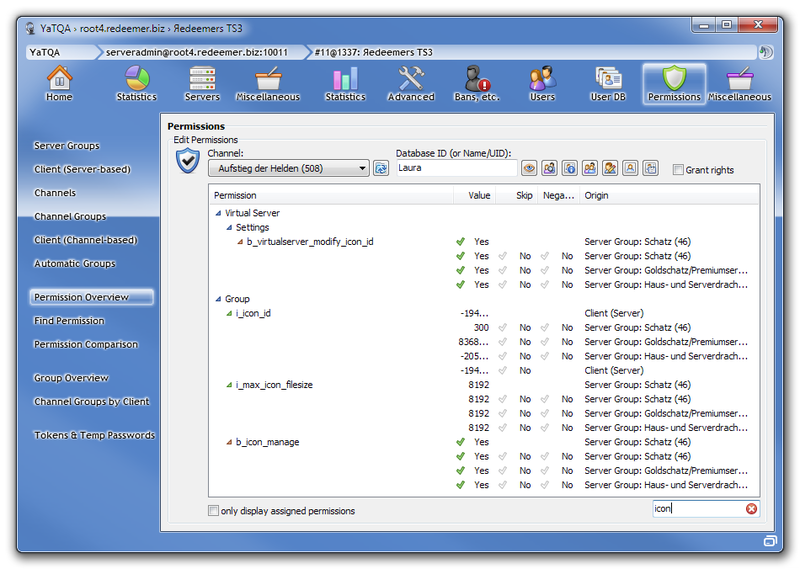 This version adds a new feature that allows you to scan your servers for people who have assigned permissions. This makes it easy to find security risks. Look out especially for member add power and permission modify power. Also, this version includes some fixes for Blacklist2. The day before yesterday, a correct response for blacklisted servers has been added to the serverside backend used by YaTQA. If you are still reported an unknown response, let me know. Thanks! This new release supports today’s new badges and brings some nice improvements. See the changelog for more info. After a day of reverse engineering the TeamSpeak 3.1.6 beta client released today, YaTQA 3.7.4-beta brings you support for its new features, Blacklist2 and server nicknames. Unlike Blacklist1, Blacklist2 is found in the Servers tab’s context menu because it works on a virtual server basis. For the Blacklist2 feature, a PHP-based tunnel server has been set up because complex HTTPS support is not available in YaTQA. Server nicknames however are simple enough to use a function in Windows. Using a tunnel server also allows me to update result interpretation, because not much is known at this point. Please report addresses for which YaTQA asks you to report them. The tunnel server does not log anything at all, so I don’t know it automatically. This version was released for testing the downscale algorithm for high-res icons added in the 3.1.5 client betas. Please report any issues. Adding SVG support is not a priority for me right now. YaTQA 3.7.2 has been released. It includes primarily bugfixes. The VirusTotal report has 1 find at the time of the release. Note: The new three addon creator badges do not officially exist yet. They won’t be displayed in the client right now if you set them in the “Self” menu. Bug: A Button That Does Exactly What It Says! First, there was a user who complained about a crash. 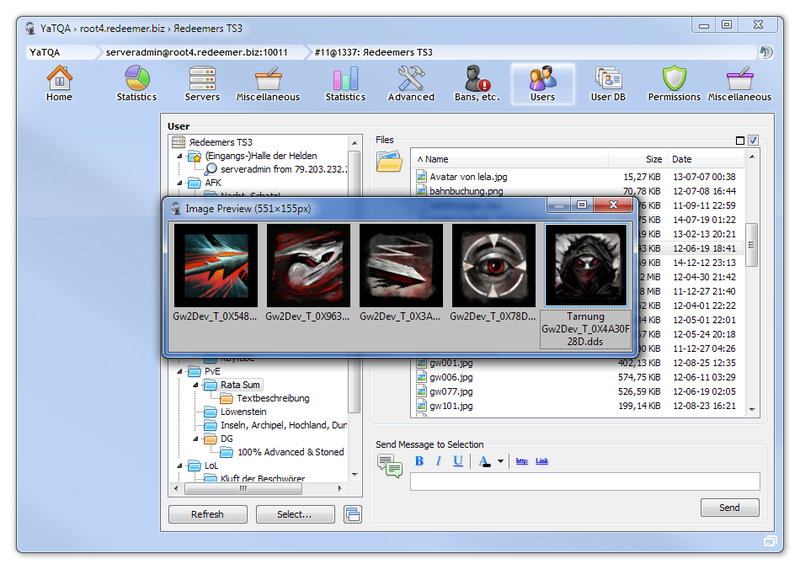 Since v3.0-gamma4 (08 Dec 2014), YaTQA displays a warning if an invalid icon made it into its icon cache because previous versions did not properly check them. More recently, icons with large dimensions count as invalid as well. The warning message notifies the users that they have to delete the icon or YaTQA might crash. Said user complained that if he chooses not to delete the icon, YaTQA does actually crash. There is a copy protection in YaTQA. It’s just so good noone will ever notice it – unless they made or use illegal copies of YaTQA. In that case, a message appears with some randomized text that doesn’t make any sense at all. Because the message makes no sense, people will report this as a bug and I frequently get complaints from people who – according to mail address and name – never registered a key. I just love trolling software pirates. Copy protection also doesn’t work instantly after entering a pirated key, so people will eventually lose all their settings including their logins. Not sorry. One day later, another user send me this email. First of all Good afternoon, I used to sleep for 1 year. YaTQA 3.7.1 has been released. It includes primarily updates related to badges. You can now configure your YaTQA client’s badges (though they won’t be set automatically, since this is more a gimmick). YaTQA can have all badges and it can have the same badge more than once. The VirusTotal report is clean once more. YaTQA 3.7 has been released. Changes include mainly improvements to the DNS resolver that didn’t make it into YaTQA 3.7-rc2b. The download is no longer hosted on my personal website but is now part of the YaTQA website. Therefore, there is no logging anymore. And no, I still don’t care about your anti-virus issues. See the last post in this blog for details or read this article by former Mozilla developer Robert O’Callahan. For those who don’t trust me, here’s the VirusTotal report on YaTQA 3.7. Lately, I really had issues developing YaTQA, because of a bug in Windows. If you disable Windows Application Experience, writing .exe files is restricted to writing the same file once every 2 minutes. No idea what sense that makes. Also, I could delete those files just fine, I just couldn't write them. So for example, I could not compile YaTQA more often than once per 2 minutes and could not download .exe files that took less than 2 minutes to download (because Firefox created a placeholder which it couldn’t replace). Also, I found out that MEGA links disappear once files get updated. So I host my dev snapshots myself now. Also, the download speed is faster than MEGA. Their sync program can only download one file every few minutes right now, but uploading works. The service seems to be under attack or so. I’m releasing YaTQA 3.7-rc2b, because people running the 3.5 series will have to update by tomorrow. While the time limits usually run out on March 1st and September 1st, I made a mistake that caused them to run out on January 1st (but the message will still say September 1st). I want everyone who updated to update to the 3.7 series because of the new DNS resolver and all the bugfixes included. 3.7-rc2b does not include much new stuff. Compared to 3.7-rc2, it displays client and channel icons in the info panels and has an option to skip all error messages during an operation with many items. The latter wasn’t even planned for the final 3.7 release yet. The time limit will still run out on March 1st, 2017, because I want to do some more changes for the final 3.7 release. The testing environment and the website moved to a new server yesterday. See the 12 Nov news why. My new ISP is PHP-Friends.de. The server is still located in the same datacenter, First-Colo in Frankfurt. I find the routing and peering to be the best one available and made a chart of vServer offers for a maximum of 6 Euros per month (in German). I need PHP on my server now and will therefore require more RAM. PHP-Friends’ offers are great, because they have a big amount of RAM, though that comes at the price of only little storage (which is, at least, SSD storage). YaTQA 3.7-rc2 was released. It includes badges support, some improved features and a big number of bugfixes. See the changelog for more details. Surprisingly, VirusTotal.com doesn’t complain about the new version. I changed my cloud sync provider again, because Syncplicity does not properly work when the client is not running while files are changed, which is a problem because I only sync periodically. It takes several minutes to find the changed files (and sometimes I’m not sure if it even found all of them). Currently, I’m trying MEGA. Links have already been updated yesterday. The performance is very bad when many files (>1,000) are in the sync queue (about 2 files per second when 10,000 files are queued) because it needs way too much CPU time to make its multi-connection technology improve the speed. I solved that by uploading folders with many files via browser (with their extension installed) instead of their client. Hilariously, the browser extension tells me to use the sync client for better performance. I LOL’ed. Once all files are in the cloud, performance for merging and syncing small updates appears to be quite good. It seems that merging is done by hash, so all existing files are read for hashing. They call the way they handle change conflicts “non-deterministic“, which is really scary. What is also strange is that it syncs deleted items and old revisions to your disk. At least sometimes. It’s not as easy as I thought to find a good replacement for Cubby. Requirements: Windows XP (YaTQA is also tested on Windows XP and much of its development was done on my Windows XP laptop until March this year), sync any folder, merge with existing folders on other devices, bonus points for versioning. Cubby had all this. Another requirements: Free 3 gigabytes of space, the amount required for YaTQA and graphics. Why free? Because the smallest plans cloud sync services offer are always some hundred gigabytes – with the corresponding price tags of around 10 euros a month. That’s an overkill. pCloud: If merging with an existing folder, the new computer has to upload all files again, even if the exact same files are already in the cloud. syncplicity (again): I did find an old client (3.5.2.28) that appears to work on XP at Software Informer. However, I wouldn’t be surprised if even the current one worked... Other than pCloud which uploads all files of merged folder to the cloud, even the most recent version of the client downloads them instead. At least that what it is saying, but then it will notice that you already have these files on your computer (and the program then claims that it did in fact not download these). To notice this, the program takes quite long (4 files per second, the files being just 20-byte snippets), that’s much longer than the upload took. But I think I will use Syncplicity now. Therefore, the links are likely to change again soon (into individual ones again, sadly with no update/upload time given). Beside changing my cloud service provider once more, I will also change my primary test server’s provider again. I simply can’t contact the support of my current provider, RackBurst.net from Great Britain. Everything is totally fine right now, but you never know how long. According to discussions at LowEndBox.com, I should better feel lucky to have gotten a server from them at all. Their previous project evorack (whose name is displayed in PayPal) caused people similar problems and its domain is now parked. My next provider is likely going to be Linevast. They do offer me to get one server free for posting a review here (you can’t get better advertising than here, can you? ), but I’m not sure if I should go for it or just rent one like always – even though you see here that I have some urge to tell you about my servers anyway. There is no cheap SSD-powered offer right now, but they are known for their Advent calendar. Hope that Rackburst will last for two more months. Cubby, the cloud space provider I use for my project files since late 2013, will be shutting down soon. Maybe that’s why development snapshot links are down and new ones break by the minute. I’m currently trying pcloud.com and links have been adjusted to this new host. The most important change is that there is only one linke for both, the English and the German snapshot, because other than Cubby, pcloud does not display the date (upload date in this case) for single files. The German snapshot’s filename is yatqa.exe, the English one’s is yatqa-en.exe, as YaTQA’s primary language is German. YaTQA 3.7-rc1 was released. It includes a few new features and a big number of bugfixes, e.g. the one that could make YaTQA appear to hang during very long operations. The most important new feature is the DNS resolver, which can now simulate all TS3 client versions released so far, which behaved in ten different ways during DNS lookups (see the changelog for more details). Get the new version from the links above – if you don't mind 2/55 heuristical finds on VirusTotal. Meh! Microsoft’s email services (Outlook, Live, HoTMaiL, MSN) seem to not deliver keys again sometimes. If you think you’re affected, let me know. I enabled SPF (Sender Policy Framework) for this domain, hoping that it will help a bit. /Edit (08 Nov 2016): I haven’t heard any complaints again, so I think this issue is resolved. Many people contact me these days, informing me about false-positives, especially by Kaspersky. Every YaTQA setup file is checked by Virustotal. As every antivirus should support the Lempel-Ziv-Markov algorithm (LZMA) that was used to compress it, the uncompressed executables are not individually scanned. Usually 0 to 2 of around 56 scanners report something. In that case, it’s always something generic (you can tell by “Gen”, “Multi” or “Heur” in the name). Other than an actual suspicion, a generic suspicion is based on heuristic analysis. The antivirus software just assumes there is a threat – with no actual evidence. YaTQA is made with Delphi and packed with NSIS. Both are very popular. Programs made with them share some common code. In simple words, if someone makes a virus with Delphi or distributes it with NSIS, antivirus companies might make “packed with NSIS” or “made with Delphi” a rule for malware, therefore identifying YaTQA as a threat. Antivirus companies appear to prefer type I errors (false-positive) over type II errors (false-negative). In other words: It’s better to block all downloads than not to block a single malicious one – because noone can complain that he wasn’t warned about a malicious download if all downloads are blocked. Example: When YaTQA v3.6.1 was released 0/56 scanners complained about the setup file, but 6/68 scanners (+1 that wasn’t sure...) complained about the download link of exactly that file. You can’t call that trustworthy, can you? Numbers have changed since, but were valid after the release of v3.6.1. /Edit 13 Sep 2016: Right now, Kaspersky only complains about the installer file, but not neither of the two files (German, English) within (which means that Kaspersky users could simply download the development snapshots found at the bottom of the changelog). Actually, no antivirus complains about the English version of YaTQA at all, but one complains about the German one. However, the English version is just the German version with other resources (this is the text and the image containing the icons for text editor toolbar). I don’t even compile the English version, I just have a script that exchanges the resources in the German version. Therefore, no executable code is changed, and code is the only thing antivirus should care about. How can you trust an antivirus that complains about text? It’s like dubbing a movie in another language and then claiming that there is more graphic violence in the dubbed version.